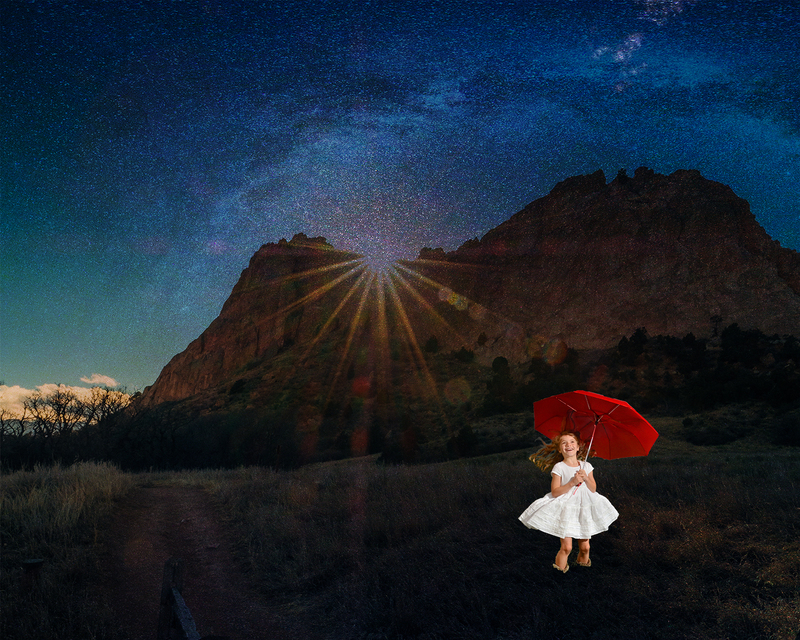 This is my digital collage featuring a Colorado mountain range, a young girl holding an umbrella, and a starry sky. This collage was made using photoshop. I was born in Kansas which is where my parents lived all of their lives. They were both born and raised in very small towns and this is simply what they were accustomed to. And sometimes it is hard to move to a new place because there are things that are much different, and you seem to be the only one who notices because everyone else is accustomed to that certain way of life. For my mom, it was the stars. When we moved to Seattle she was constantly talking about how she missed looking up and seeing a full sky of stars. None of her new friends understood this because they had never been used to looking up at the stars every night before they went to bed. My mom saying this really stuck with me and that it why I wanted to incorporate it into my collage. I feel as though my collage as a whole represents my life from the time I was born to the present through images. I tried not to use images that made what I was trying to say extremely obvious. I think that I left a lot of things open to interpretation which is what I wanted. I think one of the elements of design that stands out in my collage is the value: the lightness or darkness of a color. My collage is extremely dark, and this is very intentional. This is due to the fact that Seattle is so dark because the stars and moon are often encased by clouds. This is why, in my collage, the sun is trying to escape from under the clouds and cannot fully do so. The scene is in a constant state of darkness. Another element of design that I very purposefully incorporated was size. The little girl is obviously much smaller than the vast mountain range that encapsulates the majority of the scene. This goes to show that people are powerless to both the forces of nature as well as culture when moving to or visiting a new place. I really hope that viewers will interpret this collage in any way that makes them feel personally “at home”. I purposefully left my message somewhat vague in hopes that people would be able to find a personal connection to my work rather than pulling a message from it that I was explicitly trying to feed to them. This collage is very important to me because it represents three places that are very close to me in an abstract sense. Hopefully people can get this general idea from it, but as long as they get something from it, even if it is a little off base from what I was trying to convey, I think that that would be a success. I used several tools that are necessary for almost any photoshop work such as the quick select tool and the feathering tool (for hair). However, I made it my goal to use tools that I did not know anything about in hopes to make my piece really professional even though I have never used photoshop before. This is why I only used three images. I wanted to do the best work I could possibly do, so I spent most of my time trying to make my collage as flawless as I could rather than trying to just incorporate the most images possible. I spent a lot of extra time in the lab because of this—but I think that it was well worth it. Since I really had no idea what I was doing, I found YouTube to be extremely helpful. I would think about what I wanted to do in my collage, look up how to do it on YouTube, and then follow a tutorial step by step until I got the effect that I wanted. The most difficult thing that I did in my collage was changing the sky completely. I had no idea how to do this, but I found a tutorial that helped me a lot. In order to replace my sky, I put the starry image over the original image, duplicated the image by pressing “flip vertical”, merged the layers, and then put it in multiply mode. This is something that I had no idea how to do before, but it was actually quite simple. I think that, yes, this work did need to be constructed digitally because of the way that the sky looks. I don’t think that I could have gotten this same effect if the collage had been constructed in any other way. I really love the way that the sun is trying to shine through the clouds and this is something that I think can only be achieved—successfully at least—using photoshop.